The epic ARILUX PL-SL12 offers powerful maintenance free smart solar lighting. Powered by solar charging and an internal 4400mAh battery, you can enjoy up to 4-6 hours of lighting per night. The side LED's provide a wide spread of light and is ideal for covering large areas. With 3 lighting modes you can customize operation to match your environment. 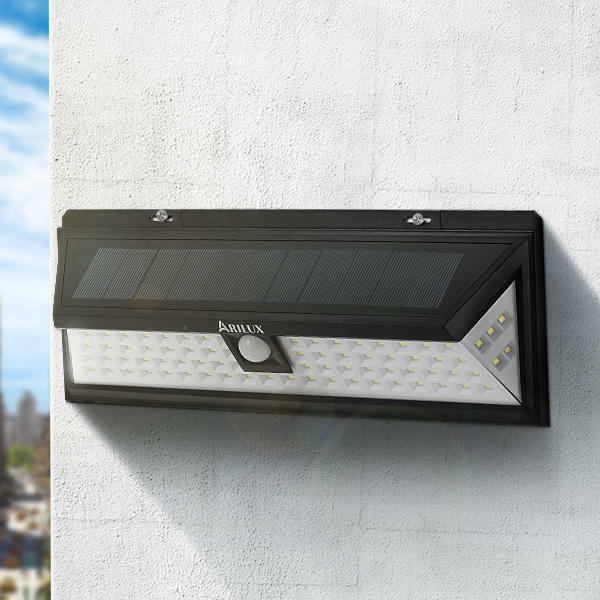 Easy to install: The self contained weatherproof light needs no wiring and can be easily screw mounted anywhere the sun shines. Motion Detection: Lighting can be set to trigger when moment is detected providing security and economical power consumption. Ultra Bright: With 80LEDs, the ARILUX AL-SL12 can brighten even a large outdoor area. The AL-SL12 delivers reliable long term lighting and is ideal for lighting even large outdoor areas. Automatically turns lights off during the day and lights up at night in full brightness mode. The lighting runs for 4-6 hours after fully charging for 7-8 hours under the sun. Automatically turns lights off during the day and lights up at night in dim mode. During the night, when it senses movement the light will brighten to full brightness mode. The light will return to dim mode after 15 seconds of no movement, if people stay active in the sensor area the bright light mode will remain on. Automatically turns lights off during the day and will only turn on when it senses movement at night. The light will turn off after 15 seconds of no movement, if people stay active in the sensor area the bright light mode will remain on.